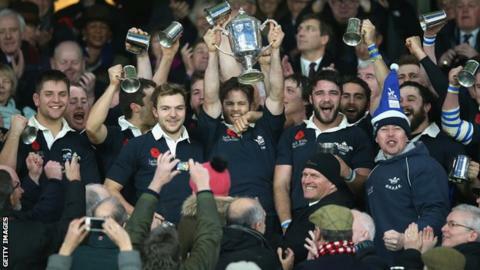 Oxford thrashed Cambridge in the biggest win ever recorded in a Varsity match in the 133rd contest. Sam Egerton, who was sent off in last year's game, and Alexander Macdonald both went over to give Oxford a 17-6 half-time advantage at Twickenham. Thomas Reeson Price and Ian Williams then touched down soon after the break to open up an imposing 23-point gap. Tries from George Cullen and Gus Jones sealed a fifth successive Varsity match victory for Oxford for the first time. Oxford named 12 returning Blues in their starting XV, while Cambridge, who have now won just once in the last seven years, had 10 Blues among their starters. The Light Blues enjoyed the better of the possession and territory in the opening period but some fierce defence and two real moments of quality saw Oxford lead at the interval. Egerton, who became the first player to receive a red card in Varsity match history last year, scored a brilliant solo try, running in from his own half following a counter ruck to put the Dark Blues ahead. South African fly-half Donald Stevens then exchanged penalties with Cullen to leave the score at 10-6 but Oxford touched down for a second time moments before half-time, Macdonald forcing his way over after his side had put together several phases to move up the field. Reeson Price scored following a maul after a well-executed line-out and Williams capped another fine move with a fourth Oxford try as the Dark Blues took complete control after the break. Fly-half Cullen, who also kicked 13 points in the match, then resisted a couple of tackles to bundle his way over before Jones added a sixth try, dotting the ball down in the corner with tiring Cambridge legs unable to keep Oxford at bay. Oxford: J Taylor*; E Doe*, M Janney*, A Macdonald*, H Lamont*; G Cullen, S Egerton*; L Anderson*, N Gardner*, I Williams*; F Taylor, T Reeson Price*, F Heathcote*; G Jones*, G Messum. Replacements: J Wilson*, J Scaife, G Western, G MacGilchrist*, W Thomas, H de Berker, H Hughes*, B Strang. Cambridge: S Allen; I Cherezov*, T May*, F Gillies, G Smith; D Stevens*, H Peck*; W Briggs*, T Pascoe*, J Poulton; J Baker*, R Hall; R Bartholomew*, H Kelly*, S Farmer*. Replacements: M Montgomery, O Exton, F Sanders*, C O'Sullivan*, D Dass, S Tullie*, J Wylde, A Rees.